On the off-beaten trail seldom ventured by other trekkers around Mardi area, in the hidden ridges of Annapurna at Mardi Himal beneath Machhapuchare Himal, fantastic views of world’s highest Annapurna-Dhaulagiri to Manaslu mountains, enchanting rhododendron, birch and pine tree forest in complete wilderness, visiting lovely traditional Gurung villages of interesting culture. Mardi Himal treking is a natural and great option if you are looking short beautiful trek in Nepal. It is presents an awesome destination to Mardi Himal & Machhapuchare Trekking on the hidden ridges of Annapurna Himalaya and towering Machhapuchare “Fish Tail Peak”. Mardi Himal Trekking a fabulous adventure on the off-beaten trails where few trekkers seldom visits this amazing area. The area around Mardi Himal was christened or named as “Other Sanctuary” after popular Annapurna Sanctuary by early pioneer Col. Jimmy Roberts, when he first explored the area in early 1970's. Adventure Mardi Himal trek begins after reaching Pokhara from Kathmandu via overland drive and then heading towards the high hills of Annapurna Himalaya, trekking for few days on the main route with views of snowcapped peaks. On the trek route of Mardi himal after Deurali ridge top with fantastic scenery our route heads on the hidden path into deep lovely forest areas of tall rhododendron, oaks and pine trees to reach isolated areas at Jungle camp with facilities of few simple lodges. Mardi Himal trekking offers the view never ends as the walk continues heading higher ridges where tree lines drop for few bushes at Mardi Himal base camp and high camps at an altitude of above 4,400 meters, our highest spot of this adventure. The scenery expands as the trail rises, offering stupendous views of Himalayan giants from Dhaulagiri (8167m) to the Annapurna group: I (8091m), II (7937m), III (7555m), IV (7525m), South (7219m) and Hiunchuli (6441m).Over 60 peaks in this region are higher than 6000m. Few other locations can offer so close an encounter. Exploring the high ridges of Mardi Himal area, the Mardi peak actually a broken sections of towering Machhapuchare Himal lower ridge line offering grand vista of surrounding mountains and amazing landscapes scenery. After a great marvelous time around hidden areas of Mardi Himal trekking, concluding this scenic walk to Pokhara with a short drive and then back to Kathmandu after completing one of the most exciting and fabulous adventure with Nepal Spirit Adventure and its guide and staff. Our Mardi Himal trek departs weekly from Kathmandu. Private treks can be arranged any time of the year. If our set departure dates are not convenient for you, you may choose alternate departures dates. Private treks are best suited for couples, families, work colleagues and small groups of friends. Customized itineraries are available as per your travel needs. 11 Days Mardi Himal trek departure weekly from Kathmandu. Private trek can be arranged any time of the year. If our set trek departure dates are not conveninet to you, you may choose alternate departure dates. Private trek is best suited for cuoples, families, wrok colleagues and small group of friends. Customized trek itineraries are available as per your travel needs please contact your trekking agency at Nepal Spirit Adventure. We will be staying at 3-star hotel in Kathmandu and Pokhara; Lodge and teahouses during the trek. All accommodations are on twin-shared basis. Nepal Spirit Adventure will arrange rooms with attached washrooms; however, teahouses in some places only have shared washing and toilet facilities. Also note that single rooms are readily available in Kathmandu and the trekking regions at lower elevation but it might be difficult to find them at higher elevations. All meals will be provided during trekking while only breakfast included in Kathmandu. While on trek, we have breakfast and dinner in the tea-houses/lodges we spend the night and lunch on our way to the next destination. Nepalese, Tibetan, the more common continental and Indian cuisines are common choices in the menu. Mardi Himal Trekking - 11 days is a moderate trek. Travelers who can walk up to 6-7 hours a day on an uphill and downhill trail will find this trek fulfilling. It is best that we prepare ourselves for the trek by jogging and exercising regularly at least a month prior to the start of the trek. Trekking to the Mardi Himal Trek should be relatively easier for those who have experience walking/trekking in a high altitude environment. Past hiking experience would be an asset but no technical skill is required for this trip. It is also important that we consult our doctor. Participants with pre-existing medical conditions such as heart, lung, and blood diseases should inform Nepal Spirit Adventure before booking the trek. 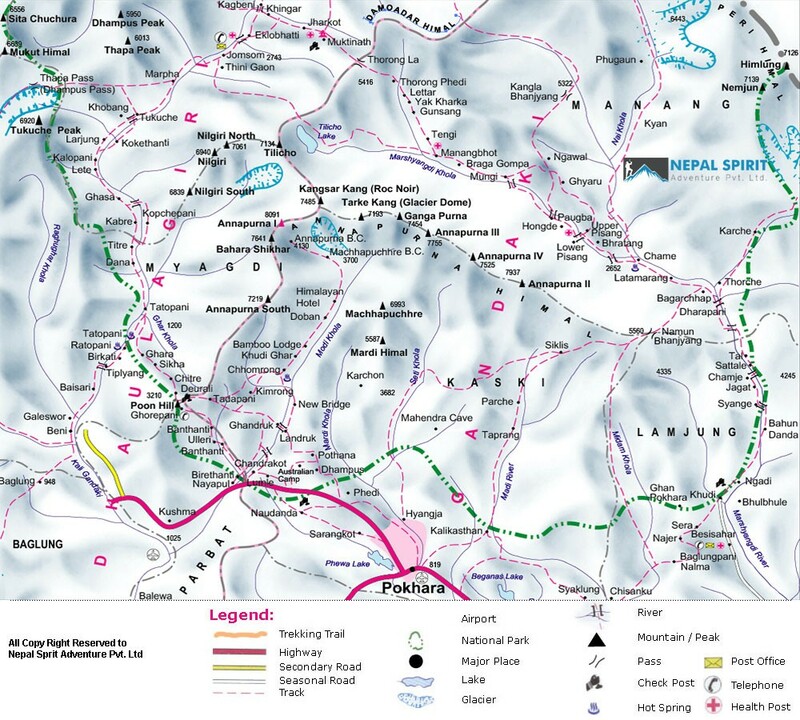 The best time to trek to the Mardi Himal trek is Spring (March to May) and Autumn (September to November). The temperature is moderate in these seasons and guarantees amazing views through the trip. Although this trek can be undertaken during winter, the cold temperature might not be suitable for everyone. Our website contains as much information as possible about this trip. However, if you wish to discuss any aspect of this trip or your suitability for it please contact us by email. If you want to talk to us directly feel free to call us at: 00977-98510- 72590"
Day 01Arrival in Kathmandu (1,315m/4314ft) transfer to hotelOn arrival in Kathmandu international airport received by Nepal Adventure Spirit Adventure airport representative then transfer to your hotel downtown in the hub of Kathmandu city, after checking in and refreshment we provides with briefing of the hotels, Kathmandu, Nepali culture with Mardi Himal & Machhapuchare trekking overnight in Kathmandu. Day 02Drive from Kathmandu to Pokhara (8,20m/ 2,700ft) 5-6 hours journeyMorning taking a tourist coach or a private vehicle (depending upon group size) drive leads on the foothills of high Himalayan Mountains and rolling green hills, passing through many farm villages and towns to reach famous and popular touristic spot in Pokhara. Located on the laps of Annapurna massive mountain range where it reflects on the serene Phewa Lake. On reaching Pokhara transfer to your hotels with time in the afternoon for walks around the lake side, full of shops-stores-excellent restaurants and nice hotels. Day 03Drive to Phedi and trek to Pothana (1890m/ 6300ft) 4-5 hoursStarting this wonderful and exciting Mardi Himal & Machhapuchare Trekking with a short drive on the outskirt of Pokhara to reach at Dhampus Phedi (bottom / base), after getting organized a steep climb on stone steps leading to farm areas of terrace field, offering great views of snow peaks and valley below entering a patch of cool forest with last climb to reach at the ridge top of Pothana village for overnight stop. Dhampus village with cooler temperature offering super panorama of Annapurna Himalaya with Dhaulagiri and Manaslu range including majestic Mt. Machhapuchare “Fish Tail” and small peak of Mardi Himal towards North West. Day 04Pothana to forest camp (2,480m/ 8,134ft) 5-6 hoursAfter a pleasant overnight inPothana with fantastic views, walk begins on the main trekking trail into forested area to Deurali with super views of landscapes and snow-clad peaks. After admiring the surrounding scenery leaving the main trekking trail heading north along the ridgeline into serene forested area with cool temperature with panorama of Annapurna I and South with Huinchuli to the east Annapurna IV -II and Lamjung Himal and then reaching our overnight stop in the middle of forest where few lodges are located for trekkers. Day 05Forest camp to low camp (3,150m/ 10,332ft) 5-6 hoursFrom this forest area, walk leads higher on uphill path with steep climb to reach a pasture land for overnight stop on route Mardi base camp with fantastic views of surrounding landscapes and mountains at close range. Day 06Low camp to High camp (4,100m/ 13,448ft) 3-4 hoursThis wonderful area offering grand vista of beautiful landscapes and snow-clad peaks in perfect tranquility heading higher to reach at Base Camp as the air gets thinner and cooler with steep climb to reach at Base Camp where tree lines fades to short rhododendron and juniper bushes. Here at Base Camp with a lonely lodge for overnight accommodation with basic facilities commanding super views of Annapurna Himalaya. Day 07Explore beyond the High camp (4,100m/ 13,448ft)Here with another night stop to explore beyond High Camp with day hike to Mardi Himal higher ridge reaching the highest point of this trek at 4,400 meters / 14,432 ft. Walk leads to a steep climb along a ridgeline to reach a hidden plateau at the base of Mardi Himal South Face with towering Mt. Machhapuchare; this area known as 'Other Sanctuary' named by early pioneer Jimmy Roberts, when he first explored this area in early 1970's. After enjoying the views of super mountain panorama return back on same route to our overnight stop. Day 08High camp to Siding village (1,750m/ 5,740ft) 5-6 hoursAfter a fabulous time on the high ridges of Mardi Himal with beautiful views and back into forest of rhododendron and pines trees, retracing the journey back on same trail at Jungle Camp and beyond with more downhill walk to reach at Sidang village located between the junction to another East and West route to Mardi Himal on warmer area for overnight stop before ending this lovely trek next day. Day 09Siding village to Lumre 3-4 hours trek drive to PokharaOur last day walk of this fabulous adventure on the hidden trails of Annapurna region walk follows Mardi River on the wide valley reaching warmer areas of rice / paddy farm villages and finally walk ends at Mardi village for a short drive back to Pokhara. Day 10Pokhara to Kathmandu by tourist bus 5-6 hours journeyMorning drive back to Kathmandu on tourist coach or in private vehicle leading on the same interesting road with few stops for refreshment and lunch, after 5-6 hours of good ride brings you back in the hustle and bustle of city life in Kathmandu. (option by air taking morning or afternoon flight to Kathmandu with 30 minutes of scenic views during flight from Pokhara to Kathmandu). Day 11Final departureAfter wonderful time on the high hills of Annapurna to Mardi Himal & Machhapuchare trekking with grand service of Nepal Spirit Adventure, as per the flight time transfer to international air terminal for your departure homeward bound or to next respective countries. Transfer by private vehicle on arrival and departure. Two nights hotel in Kathmandu with breakfast. Comfortable tourist bus from Kathmandu to Pokhara to Kathmandu. Private vehicle: Pokhara to Phedi and back to Pokhara after end the trek. Experienced government register trekking guide and 2 trekkers: 1 porter price including daily wages, medical insurance-transportation allowance- meals and accommodation. Twin share lodge accommodation during the trek. Trekking food: Breakfast, lunch and dinner with a cup of tea / coffee. Nepal Spirit Adventure's trekking equipment: Down jackets, Sleeping bag and duffel bag. All the government and local tax with paper work. Nepal Spirit Adventure exclusive medical kit. Personal expenses such as laundry, bar bills, battery recharge, extra porters bottled or boiled water, shower, heater and phone calls etc. Travel insurance & Rescue operation. Food and extra nights hotel in Pokhara and Kathmandu (due to an early return from a trek, or an extended stay in Nepal). Additional trips or tours in Kathmandu. Normally Nepal visas can be easily obtained from the Government of Nepal, Nepalese Embassy or Consulate office located in your country. If you have left your home country and/or you dont have time to visit the Embassy, you can get a visa from the Tribhuvan International Airport in Kathmandu on your arrival or from any other entry point in Nepal. Make sure to bring a few sets of your passport size photos. Visa fees are inexpensive. Visa can also be obtained at the nearest Nepal Embassy or Diplomatic Mission. Visa can also be obtained (renewal purposes) at Department of Immigration, Kalikasthan, Kathmandu.A valid passport and one passport -size photo with a light background is required. Immigration Department has not specified the size of the passport-size photo. Tribhuwan international airport (Kathmandu), Kakarvitta, Jhapa (Eastern Nepal), Birganj, Parsa (Central Nepal), Kodari, Sindhupalchowk (Northern Borde, Belhiya, Bhairahawa (Rupandehi, Western Nepa), Jamuna, Nepalgunj (Banke, Mid Western Nepal), Mohana, Dhangadhi (Kailali, Far Western Nepan) Gaddachauki, Mahendranagar, Far Western Nepal). When you arrival in Nepal at Tribhuvan International airport of Kathmandu, our staff will greet you then transfer to your hotel, evening we invite you welcome dinner. Next day you have a completely rest day or can join with our regular city sightseeing tours of UNESCO world heritage site or participate rock climbing training before heading to peak climbing. In the late afternoon we will review your trip itinerary with service outline, introduce you to your guide and help with the final preparation for your trek. In city, only breakfast is included on the offered trip itinerary. During the trekking session full board meals are included (breakfast, Lunch and dinner with cup of tea or coffee). We provide you food from the local tea house Mt. Lodge en route chosen from a menu. Breakfast and dinner is to be provided from the same tea house we would overnight but lunch would be en route in between. Although the food is usually plentiful and delicious, you should be aware that the menu is not normally extensive due to the extreme locations. Most teahouses offer a variety of rice and noodle dishes, as well as soup and seasonal vegetable. A variety of cereals, bread and egg dishes are generally available for breakfast. About the drinking water is very important while you are trek on the high altitude we recommended should drink at least 3- 4 litters water a day, we provide filter clean natural water with adding purification pills are included in our trip package. Beside of this, if you wish to drink sill packed mineral and boiled water you can buy en route the cost is extra payable. Our health is most important part to travel and participate for trek and hiking. If you do not have previous trekking experienced is required, better you could do morning walking exercise or cycling till 1 month before you join any trek, hiking and climbing. If you have, it is a great plus point because this trek is a non technical walk. The highest height you will reach on this trip is 5545m from the sea level. The walk involves lots of ups and down, takes you through local village, farming lands, terraces and river side as long as you have strength of walking for 4- 6 hours a day, and you are qualified for the trek however you should be having a moderate health and faintness. Nepal Himalayas Hikes take you on the remote region, it is very necessary that you are accompanied with the very experienced and qualified, equipped leader (guide) for that safe and successful trip. We Nepal Spirit Adventure employee the local trek guide and stuff who are trained and qualified on the trip we worked on. Easily he will share his local information, and provide advice on how to fill your free time as well as co- ordinate the day to day running of the tour although occasionally he may need your understanding if things do not go according to plan. Our trek guides are fully trained and licensed from Nepal Government, certify from TAAN and Nepal Mountaineering Association. All of our trekking and climbing guides are experience from last 9- 10 years. We also provide training for our staff, thus attractive their work efficiency for your trip to supply the flexible needs of our peoples in the group joining basis trip from different countries, this double assure you that your trip is at the right and expert management. Our guides are well known with all local castes and customs along the trails and will share with you many cultural insights that are not covered in any guide book. You will have many chances to learn Nepali phrases and other cultural aspects during your trek. As we organize at every trek in Nepal, In group trek we provide one trek leader and one assistance leader on each additional two peoples on the trek- this arrangement would ensure that even if any of our guide/assistance guides get sick or if any travelers gets sick and need to be back or delay the days of walking, it would still works smoothly and there would not be any problems on our original trek plan. Also we provide each two trekker would have one Sherpa helper for carrying your trekking bags. It is our companys management system; the maximum load carried by our porter is 20 to 25 KG so be sure that your trekking bag is not loads more 20 KG. Nepal has two best seasons to attempt this trek to Everest Three High Passes, as this trip is a big trip to you, we always recommend you to come at the right time of the year as far as possible. Trekking in Nepal is possible at any time of the year, depending on where you are going. In Nepal you can trek somewhere in any of the four seasons, but the most popular trekking seasons are autumn and spring. Nepal Spirit Adventure offers you to consider the following advice on the outstanding aspects of each season. The autumn is one of the best seasons for trekking in Nepals Himalayan region and offers excellent weather and outstanding mountain views, the weather is clear and we can pretty much guarantee fantastic mountain views and beautiful panoramas. This season is the peak trekking season in Nepal and you can also see many big Hindu festivals such as 15 day long Dashain, the biggest in Nepal, celebrating the triumph of good over evil, and shortly afterwards the 5 days of Tihar Dipawali. Winter is renowned for snowfall at higher elevations, the snowline descends considerably, and the weather is cold. So it is an ideal time for trekking at lower elevations below 3,000m in the foot hills of Nepal with great views of the Himalayas, it can get cold at night and in the mornings, but during the day temperatures are mild when it is sunny. The spring is the best season for trekking in Nepal. Many people travel from different countries to Nepal in the spring as trekking is good in all regions. The meadows are in full bloom, which makes it a good time to discover the many varieties of wild flowers Its also the time to see the rhododendron forests in full bloom that make the hillside above 4,000m an impressive and unforgettable paradise during this season. The weather is warmer at lower elevations and at the higher elevations over 4,000m visibility is excellent and temperature is quite moderate. During summer trek is warm and sweaty in the wet summer months, and also constitutes the monsoon season which can continue up to mid-September. Summer is a good time for the keen botanists and forest researchers as the higher valleys and meadows blossom with flowers and lush vegetation. It is not generally recommended to trek during the summer season except in the arid rain shadow areas like Upper Mustang, Dolpo and Kailash. Everywhere else is in the grip of the monsoon, although the mornings are often clear for a few hours and you can expect beautiful sunrises, it rains almost every day, clouding over by mid morning, with frequent rain and occasional thunderstorms in the afternoon and evening. The advantages of trekking in the summer months are the uncrowded trails and reduced cold in the high mountain areas. While you decided to book your Nepal trip with us choose your Nepal suitable holiday trip what we have gone through online product, write and ask the information or phone us on our phone number for the trip booking confirmation. To be very clear understanding about the trip services we have also online trip booking option, you may go on that link, chose your trip and date and follow the instruction with information required and summit us. Once your trip booking request reached to us, sincerely we will suggest you the final trip booking procedure with advance payment of the trip, Non-refundable deposit of 20 percentage (per person) is required to confirm a place on your selected adventure Nepal activities.